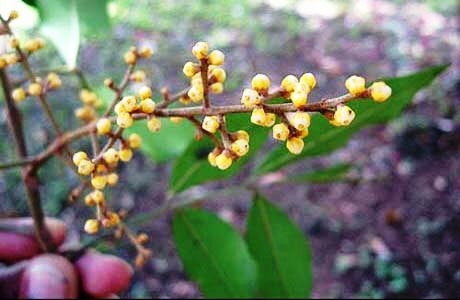 Chokkala grows all over the tropical parts of the Central Asia, South East Asia, Pacific and Australia. 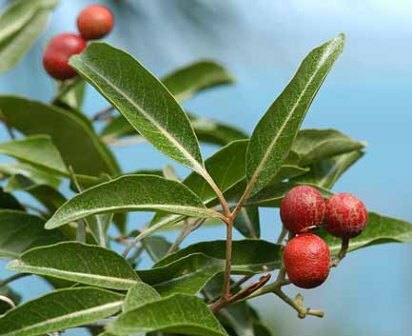 In India, it grows in the dry as well as wet evergreen forests of the Western Ghats and the South and Central Sahyadris. Evergreen tree, upto 10 m tall; bark grayish brows, lenticellate; blaze reddish brown; exudes white latex which is not profuse. Leaves compound, imparipinnate, alternate, spiral; rachis 1.5-3.5 cm, slightly canaliculate above, lepidote_scaly; leaflets 2-3 opposite or suboppositepairs with one at terminal, 3-7 x 1-3 cm, narrow-elliptic to oblanceolate, apex bluntly acute to subacuminate, sometimes obtuse, base acute to cuneate,chartaceous, young leaves densely lepidote_scaly, glabrous when; midrib slightly raised above, secondary_nerves 8-13 pairs; tertiary_nerves very slender, broadly reticulate. Inflorescence axillary panicles, shorter than leaves, lepidote scaly; flowers dull, yellow or buff coloured. Seeds one or two, enclosed in a mealy, edible pulp. The fruits, which taste acidic, are edible. In Ayurveda, the fruits are reported to be cooling, astringent and are recommended in inflammations and febrile complaints. The seeds are said to be useful in painful micturition. 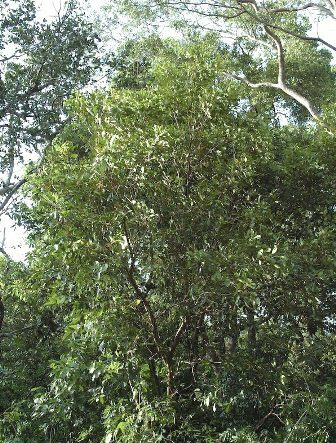 The wood of this tree is light brownish yellow, heavy to very heavy, very lustrous and hard. In Indian villages, it is used for making spokes of wheels.